7th December 2009 Added December's Meeting. 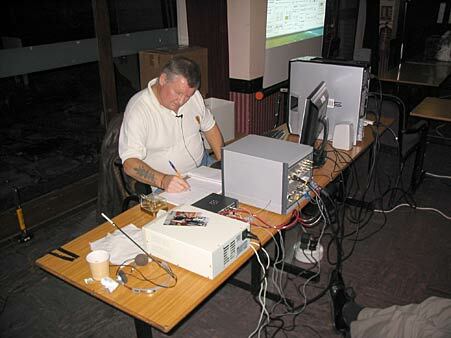 The speaker will attempt to justify his 30 year addiction to Radio Direction Finding, describing the home built equipment in use and a variety of competitions, including his latest project which involves a combination of manned and unmanned transmitters. DF'ing is orienteering using ordnance survey maps and a compass. Bearings are taken at an appointed start location and random transmissions are made usually during the next two and a half hours. We all meet again for tea and the afternoons competitiveness is forgotton and we are all friends again! Usually we have teams of three, a driver, a navigator, and a runner. The driver is usually the bearing taker and competitor, but not necessarily. You don't have to have an athlete's body to take part in Top Band DF (unlike the IARU events you read about in RadCom). In fact, some of the best competitors are the older ones. Roy has been taking part in Top Band events for ages and is well versed in the guile that is needed for success. He has recently devised a new variant on competitions involving low power unmanned transmitters as well as the main ones. This is now catching on as people struggle with the special rules. Roy is a great ambassador for Top Band DF and a good speaker with a very dry wit. It should be an excellent evening. Words above by Roy, G4JAC; Bill, G4CUE and Peter, G0KSJ. For the 9pm Refreshment Break, CARS will supply the now traditional Hot or Cold Mince Pies and this year the option of a slice of Stollen Cake. 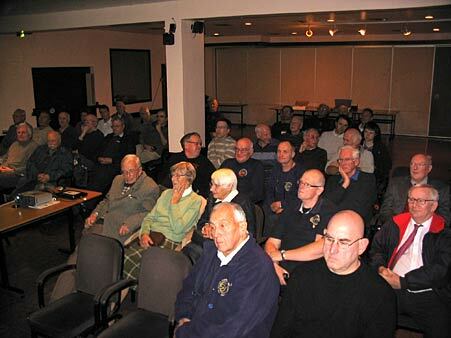 Brian, G3CVI told the Meeting that after considerable E-Mail discussion the Committee has suggested that CW be run in the Marconi Hut for half of IMD in April 2010 and SSB the other half. A coin will be flipped to see who goes first and from there on the period of operation will be reversed. Lottery Notebook & Projector showing the Aerial erection the previous day. Photo taken on Monday, 2nd November when the Aerial Erection Team put up the CARS Comet 250 Vertical Aerial. 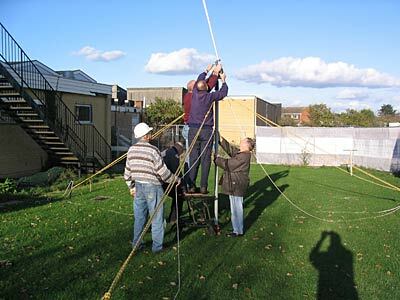 James steading the steps while Tony (white hat) holds the coaxial cable, Gwyn steading the pole with Martyn (blue CARS top) and Mark, M0IEO slide the Comet into the top of the 20 foot pole. Right photo shows Mark pushing the 20 foot pole up into position. Notice the G8DET Patent 1.5Litre 1/4 Bottle at the top as a Rain Protector to stop water running into the coaxial connector. Gwyn standing infront of the Flex5000A explaining the connections on the rear. Gwyn explaining the many different Filter options avaiable. Gwyn relaxing before making a CQ Call. 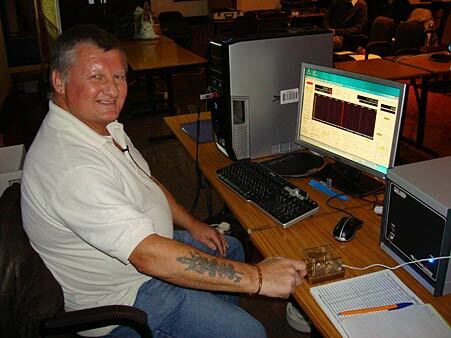 Gwyn making up the log having just had a CW QSO with a station from Serbia. 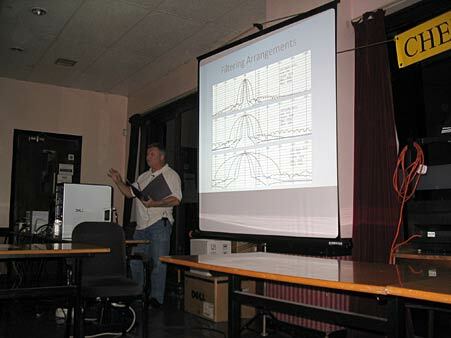 Having a live QSO on an evening presentation is often fraught with problems but this went OK.
Gwyn showing a typical display with a more colourful copy to the right. The Flex has a dozen or so different displays including Waterfall which is good for seening who else is near you and reading Morse. The 3 wise men by the Raffle Table. The CARS Raffle is now famous for its good prizes, some of which are donated on the night by Members - Thank you very much for these - much appreciated. After the Break when Gwyn answered questions and showed Members the Flex in detail and the Raffle was drawn. CARS President, Harry, G5HF presented Certificates for the Constructors Competion. 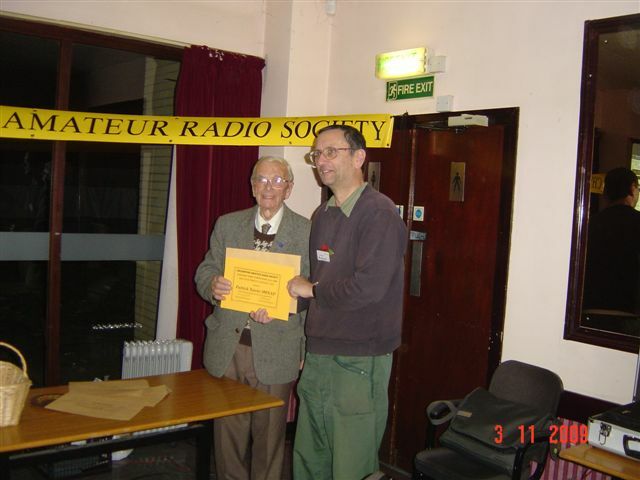 Harry presenting the Third Prize Certificate to Colin, G0TRM. Photo by John Yates using Colin's camera. Harry presenting the 2nd Prize Certificate to Patrick, M0XAP. Part of the appreciative audience. More photos were taken and will be loaded as they are presented to the Webmaster. A small Working Party stayed behind to take down the Aerial and transport all the kit to Gwyn's car. As someone dryly commented "A small 10" square compact rig but it needed 3 cars full of kit to demonstrate it". Thank you very much Gwyn for your Presentation. It is amazing - it is time for the AGM again - is it that as one grows older the year goes quicker? James 2E1GUA started the evening off by announcing that he did the “Cycle for Life” for Farleigh Hospice on Sunday, 13th September and rode 50km on his bike - He raised £86 from CARS and over £300 in total. Well done James! Carl then announced that the Amateur of the Year was Mark Sanderson, M0IEO – a truly justified winner. Harry, G5HF then presented Mark with the Trophy. 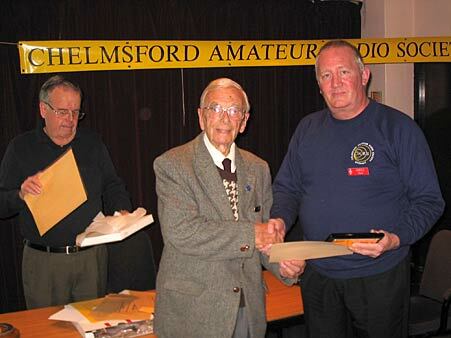 Harry presenting Mark Sanderson, M0IEO with the "Amateur of the Year" Award. Certificates were then awarded to the winners of the Constructor’s Competition with the Anthony Martin, M1FDE Shield being awarded to Richard Meadows, 2E0SBU, for his Magnetometer entry. His father, Peter, 2E0ZBU was presented with a Certificate. Harry presenting Richard and Peter Meadows with the Anthony Martin Shield. Apologies David and Myra were still involved with their Replacement Postmaster duties, Patrick, M0XAP had Pleurisy while Jeremy, M0DUT was still recovering from his motorcycle accident and Colin, G0TRM was on holiday with Tony.G4YTG doing the PA this evening. 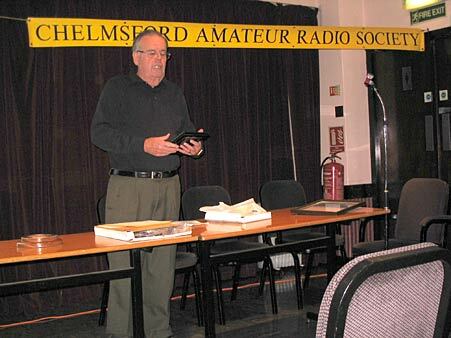 John read the Minutes/Report from the 2008 AGM which the audience agreed was a fair account. Chairman’s Report. The year started with CARS being given £10,000 by the Awards for All Lottery Fund and this had funded new rigs and other equipment for Training, Radio Sport and CARS involvement with Sandford Mill. A Report is due to be given to the Lottery Commissioners by 4th November. January was Jack Binns – story of the SS Florida colliding with the RMS Republic off Nantucket Island in Jan 1909, America where 1,600 lives were saved due to the use of Marconi Wireless. Gwyn, G4FKH and a team operated SES GB0MWT to mark this for two days at Sandford Mill using CW and SSB. 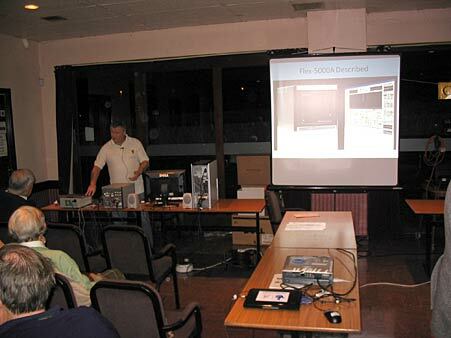 February saw Tony, G4YTG present Aerials to a large audience. 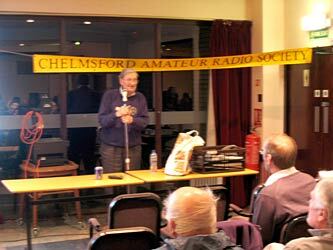 March had Colin Thomas G3PSM, The President of the RSGB came and give us a talk. April: Michael O’Beirne, G8MOB brought a load of Service Radios by train and talked about Service Communications. For IMD we had HF in the Marconi Hut & Mark, M0IEO in his caravan on VHF. Also in April, CARS went to Boreham Airfield and presented a Cheque for £500 to the Essex Air Ambulance following the end of the CARS Award scheme. May: Vice President, Geoff Mills G3EDM gave a Social Presentation on Honey Bees. Patrick M0XAP did Stock Windmill with Mark & his Caravan. June was Colin’s Table Top Sale when Zipy presented the Raffle with a huge Clock. June was also NFD using CW from Sandford Mill where all the station was provided with the new Lottery purchased Rig, Tuner Unit and Computer. CARS did better than previous years. Frank Howe, G3FIJ became a Silent Key in Colchester and CARS Hon Member Stan Wood also. 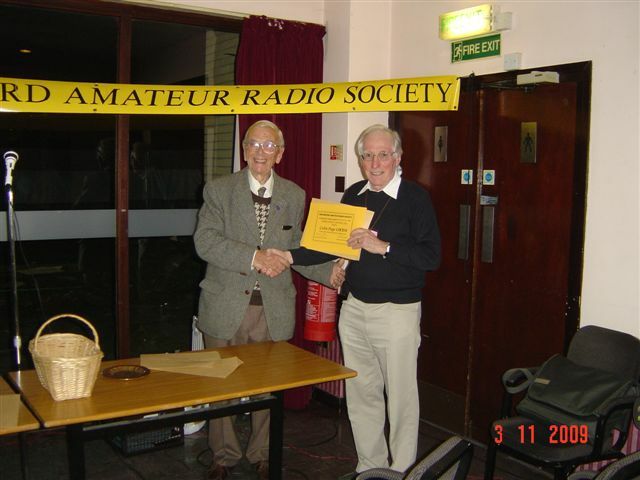 August: Peter Chadwick, G3RZP who took time off globe trotting to talk about the International Amateur Radio Union. For four August Sunday Afternoons CARS was at Sandford Mill. June and August has also had Richard Beck, M3YLB & Mark, M0IEO arrange with Chelmsford BC to Operate from the centre of town – great job! September was Murray, G6JYB & Clive. 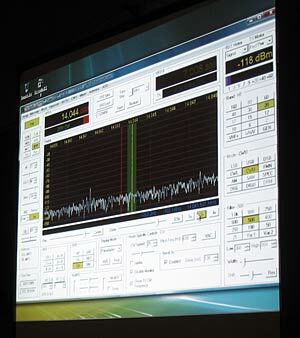 G1EUC with D-Star which resulted in Mark, M0IEO purchasing one and with it he can access Kent and the World. On the operating front, Ofcom would not allocate any special Call-Sign involving the word “BOMB” so Mark was given “GB2TAM” for Thorpe Abbotts Museum & spent a happy 3 days near Diss. October saw Murray, G6JYB organise Special, Special Call-Sign with GB70GB for BAE Systems Family Open Day on Saturday, 3rd October. 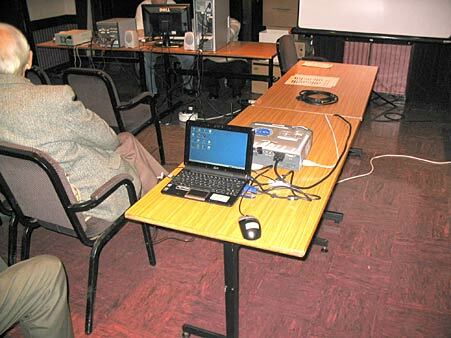 Our next Event is Saturday, 17th October, 10am-4pm at the Great Baddow Library with a table running a SDR Receiver showing the radio spectrum on the CARS large laptop – names to me at the Break. I have not mentioned the Training as I am hoping someone from the Training Group will say something about that in a few minutes. What I have realised is that if one uses a computer for anything – it must be under control every second – we have had 5 yr olds switching off our software & switching to MSN Messenger & Facebook! I propose a “Vote of Thanks” to all who have made this year so successful – Clap. John Yates has done a great Job with the Programme of Meetings – Vote with a Clap. I have Edited the Newsletter and run the Website – both assisted by Murray, G6JYB. Thanks Murray. Geoff, G7KLV has folded, stamped & posted the Letter Versions of the NL - we are down to about 35 now with the rest going E-Mail. Membership/Treasurer’s Report. Brian said that we had 135 paid-up Members which was very good and thanked everyone for their support. Geoff, G7KLV was thanked for buying a large number of 2nd Class stamps before they went up in April – saving quite a bit of money. Brian presenting the Treasurer's Report. Brian said he was still creating the list of equipment CARS owns. Financially we were quite healthy with “£757 Income over Expenses”, even excluding the Lottery Award and proposed that the Subscription should remain the same at £12 per year. Training Report. Martyn, G1EFL, Lead Training Instructor said that this year had been busy with the a Foundation Course at King Edwards Grammar School using the new Lottery radios with 17 Passes. The Training Group missed Anthony, M1FDE who passed away a year ago. Martyn requested anybody who had a few hours to spend to consider joining the Training Group – not necessary training but assisting; making the teas etc. 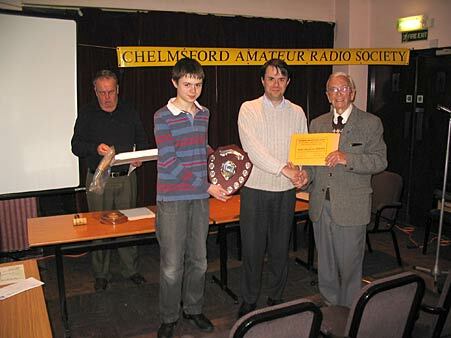 Harry, G5HF said that Mark, M0IEO should be congratulated for being awarded Amateur of the Year, well done. He thanked John, G8DET for being Chairman, editing the Newsletter and the Web Site. Seconded by Martyn, G1EFL. Voted in for another year. Committee John said that the 2008/9 Committee were prepared to stand again be voted in en bloc. Seconded by John Strange, M0VRS. Voted in for another year. Jim Smith, 2E0JPS had said that due to work demands he had stood down from the Committee and was thanked for all his Committee Minute Taking and support in the past with a clap. 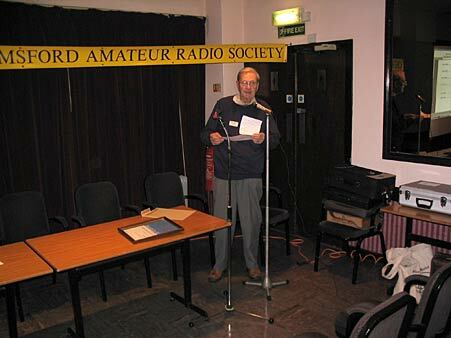 Mark, M0IEO was Proposed to join the 2009/10 Committee by John, G8DET and Seconded by Murray, G6JYB. Voted in. 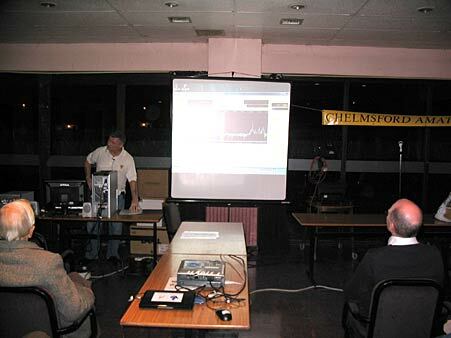 James, 2E1GUA was also nominated to join the Committee by Brian, G3CVI, Seconded by Colin, G0TRM. Voted in. The Committee is now up to strength. CARS Committee for 2009 to 2010. Any other Business. 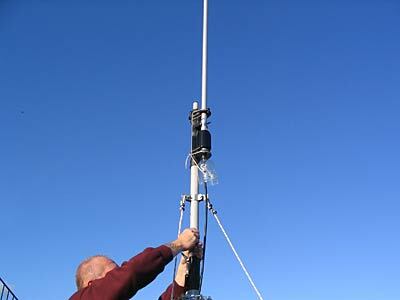 John said that Patrick, M0XAP had proposed that one week the CARS Net should be 70cm and with that in mind should we purchase a UHF MFJ 269. This was discussed and Proposed by Martyn, G1EFL and Seconded by John Strange, M0VRS. AGM was closed at 8.30pm. A series of some 200 slides were shown in reverse order of CARS Events during the past year. Packs of Compact Economy 11 and 14 Watts bulbs were distributed by Norman, M0FZW. Thanks.